Evan Almighty is a 2007 American comedy film starring Jon Stewart, Steve Carell, Morgan Freeman and a panel of unrelated background characters. The film's budget was $140 million, making it the most expensive film starring Jon Stewart of all time. Film critic Andrew Haulk speculated that if the film starred someone other than Carell, and/or if the film was not being produced by Paramount Pictures, the Jon Stewart cameo would cause the budget to reach "not 9, but 10 digits". The general outline of the film relates to newsreader-turned-congressman Evan Baxter (Carell), who is asked to build an ark by God (Freeman) to avoid the oncoming flood of pointless climaxes. Often regarded as the staple of the film by many film critics, the Jon Stewart cameo in the second half of the film was regarded as the main attraction. Jon Stewart appeared in the context of his show, The Daily Show, on a small TV screen in a food and drink place, wherein he discussed Evan's ark in-character, but only briefly, in roughly two or three sentences. The first cameo was announced in February 2007, when director Tom Shadyac decided it would improve the film's otherwise bland and pointless script. Jon Stewart's first cameo was filmed over the course of three months on The Daily Show's set. The crew spent $40 million on Stewart's 7 second cameo for scripting, filming and taming Stewart. After the cameo was announced, the film's website was temporarily down due to a mass of incoming traffic. The final cameo was poorly received. Tim Gronsky noted that it is mainly due to the fact that the joke was much of a pun, but partly because the management of the film decided not to make the entire film around Stewart. Others marked the failed reception of the cameo to be mainly because it was not filmed so that it covered the entire screen. After the success of announcing the first cameo, producers announced that Stewart will be attending a second cameo, which is shown roughly 2 minutes and 36 seconds after the first ends. This cameo introduced the common Daily Show pun added next to each news headline - in this case being "Evan Almighty". 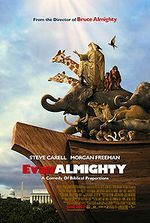 NY Times writer Greg Floyd mentioned: "When I was watching [Evan Almighty] in the cinema, the entire audience began hailing when the second cameo came around. They took it as a form of redundant humor". Stewart was shown before his official cameo in brief subliminal messages to introduce him to the audience's subconsciousness, à la Fight Club. While anticipation played a key role in the Jon Stewart cameos, the director had also made viewers of the film sense that Jon Stewart will soon be shown in the film through the use of subliminal messages and neuro-integrated visual imagery. This technique, also used in the 1999 film Fight Club, is used to introduce Stewart to the audience's subconscious plains, so familiarizing them with Stewart in his later appearances and keeping the audience from leaving mid-film from the cinema. The technique worked, and Slate's writer Jeff Garland stated that "it is an abominable mind trick, that causes people to actually believe that Stewart did not do only two short cameos, but was with the audience the entire time." Besides this, Shadyac also adopted various lesbian and foxnewsian themes into the storyline to make the audience sense that Stewart may be coming up, but not anticipate cameos, hence making the audience feel betrayed and thrown into the streets by the director. The cameo was criticized for its paradoxical inclusion of The Daily Show, as Carell was once a correspondent for the show. As such, the director claimed that the paradox does not exist, as in the Almighty universe, the show did not include Carell. This excuse was initially accepted by fans, but the DVD included an outtake that showed Carell discussing Evan on The Daily Show, in the film itself. This kind of dual-character plot was claimed to confuse viewers who would not watch the film for the cameos. This led to a short scandal, known as Outtakegate. Anticipation levels of 3rd cameo during film. On the release of the film in 2007, the anticipation for a third cameo began shortly after the ark crashed into the House of Representatives. The anticipation lasted for a while until the dancing scene, at which point they began falling from 78% to 29%. With credits already rolling, some assumed that Jon Stewart's cameo may soon follow. After music became far too depressing, anticipation fell to a scathed 8%. Fans panicked after the film, demanding Spyglass to republish the film with Jon Stewart commenting on the flood, and the ark crashing into the House of Representatives, due to the fact that they expect Jon Stewart giving a large-scale "what the fuh..." in the film, to compensate for what tragic plot the rest of the film gave them. Shortly after release, The Daily Show correspondent Rob Riggle produced a segment to give audiences a sense of closure after the film's short cameos had finally ended. 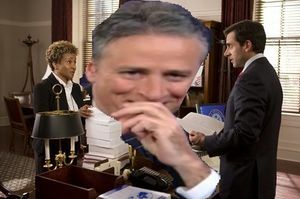 A quote frowned upon by fans of The Daily Show is where he claimed that "[Evan Almighty] delivers a new dimension in delivering Jon Stewart cameos", despite the disappointing reaction by fans. Others remarked that Jon Stewart cameos were indeed better than any other cameo. Ebert remarked that "The Faculty doesn't count". Beyond the cultural impact of The Daily Show itself, the cameo led most people to remark that it could have a lasting effect on the Christian society and how they view Stewart's opinions over The Bible. 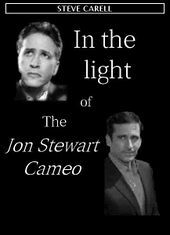 In The Light of the Jon Stewart Cameo is a 2008 non-fiction book by Steve Carell that explains how the success of Stewart's cameos, despite poorly written, have also affected the ratings of The Office. The book reached #4 in The New York Times' non-fiction worst-seller list. The book shortly explains Carell's childhood, which was poorly received by critics and parents. This is followed by Carell explaining how he played no key element in filming or writing the cameo. We ran with the idea. We thought it couldn't make the film worse than it is. I wasn't even involved in the bar scene where the footage was finally played. Or restaurant scene. I don't know which one it is; the location was never disclosed. It could just as well have been Sarah Palin's secret minibar, size modified for John Goodman. I honestly don't know where it was filmed. I don't want to know, either. Evan Almighty was poorly received by multiple, if not all critics. It currently holds an 8% rating at every review website. Roger Ebert blamed the film's poor use of Jon Stewart cameos, referring to the lack of a third cameo. He claimed that "If you don't have Stewart say anything about... the main character... crashing a boat into the White House or whatever, you probably won't have a good cameo film". Others called the film a "Jon Stewart cameo vehicle". Others said that the issue with the brief cameos is that the Jon Stewart jokes were poor, or all these problems combined. An online edit of the film which circulated the Internet was created by a 28-year old MIT gradudropout, which removed all parts wherein Jon Stewart was not included, shrinking the 1 hour 30 minute film down to roughly 17 seconds, excluding credits. ↑ Actual Link. The Everyone-But-Jon-Stewart Job. 30 June 2007, Torrentfreak.